The Family is the world’s smallest community. It is the basic platform of the human society from which larger communities, nations and the human race came forth; even animals and plants belong to families. We are all products of families; even that child that was born and abandoned in the waste bin by a senseless mother is a member of a family; though a discordant one. We often say that: “charity begins at home (that is from the family)!” And so it is with other realities like hatred, rancor, strife, anger, immodest life and others. In essence we can say that the family as the early learning centre is the root of all good and evil. Today we are called upon to reflect on the Holy family of Jesus, Mary and Joseph. This reflection is very important within this season of Christmas which is a family oriented celebration. It is also very expedient as family and family life in our day and age need to be revisited, reconstructed, revived and given new direction. The first question that faces us as we do this reflection is: “what “made them holy?” This question leads us to another: “what constitutes holiness?” To be holy among other meanings has to do with being set apart and dedicated to something sacred or divine. So to answer the question, what made them holy includes but not restricted to their steadfast dedication of their lives to God and their commitment to divine direction. They were able to achieve these within the framework of their vocation as members of a family. This family is called holy because it loved God above all and the members were ready to do the will of God at all times. The family is called holy because each and every one in the family revered, appreciated, and celebrated the presence of God in their family. Joseph accepted and carried out God’s plan (Matt.1:19-24; 2:19-21). Mary fully and unreservedly accepted the will of God for her with striking humility (Luke 1:38). Our Lord Jesus Christ had the doing of his Father’s will as the indelible script of his mission on earth (Matt. 26:39; Luke 22:42; Jn. 6:38). In all these instances we can collectively agree that the first step to holiness is the readiness to submit oneself to God’s divine will. The ability to let go one’s interests and plans and concentrate on God’s own plans and will. The holiness of this family was not without trials, temptations and difficulties. They had their sorrowful moments but they kept their faith in God. The flight to Egypt when Herod was planning to kill the infant Jesus few days after his birth was a great trial for the family (Matt. 2:13-15). The missing of Jesus when he was twelve years old on their way back from Jerusalem was a trying moment for the family (Luke 2:43-49). One common denominator is that these and other trials and temptations that the family faced, they were not distracted nor was their love for God and for one another reduced, neither was their connection to peace and carrying out the will of God. The family in the modern world, as much as and perhaps more than any other institution, has been beset by the many profound and rapid changes that have affected society and culture. (FC.1). In most families today people are staying together not living together because peace is farfetched. In most families people are disconnected and alienated from each other because love cannot be found. In most families parents take orders from their children while the children give their attention and allegiance to television, telephones, electronic games, internet and other prodigies of modern media of communication. In most families prayers and faith in God are outdated practices while respect and obedience (to God and humans) exist as archival materials. The first reading today presents Hannah to us as a woman of prayer and faith in God. Her ardent supplications and trust in God brought her conception and the consequent birth of Samuel. Most families today are facing the same challenge of childlessness. On account of this some have decided to end their marriage unions, while some have despaired and dissipated finally. Hannah thus stands as an example of dedication and commitment to God in spite of the storm. On the other hand some families have become “abortuaries” where “unwanted” pregnancies are removed like pimples. Some give reasons like: “I was not ready for the pregnancy”. But this should have been a question before the event that led to it and should have been formulated thus:”Am I ready for the pregnancy that may result from this?” Some families have been on the constant practice of taking their worries and other challenges to other gods. This is blunt inattention to the word of God (Psalm 16: 4): “Those who choose other gods increase their sorrows”. The various families in the world are called upon to reflect the values that formed the foreground of the Holy Family of Nazareth. Our families need to be hallowed especially in a world like ours that is overwhelmed by so much profanity. We need to set our families on the part of holiness not by how many times we attend masses or other devotions but on how often we are able to love, forgive, assist, and bear with one another. There is every truth in the fact that the easiest way to destroy the world is to destroy families. This is actually the tactics of the devil and those who are knowledgeable in the things of the spirit are attentive to this work against it. Like cars and other automobiles, families need servicing every now and then. This feast of the Holy Family comes at the right time for families to gather together and revamp their structure in order to make a fresh and more reintegrating beginning as the New Year draws near. This is an auspicious time for families to take some time to evaluate their strengths, weaknesses, opportunities and challenges. This will be a time to accept our mistakes, make amends and work towards a better and more rewarding life in the family. Whichever family you find yourself is divinely willed; it is not by accident that you are a member of your family. There is a purpose for your being where you are now. Some people waste their lives blaming their families for the ill situations in their lives. Thus, cursing the darkness instead of bringing in a light. Though your family background may not be good enough, but your background has no right to keep your back on the ground. As we celebrate the feast of the Holy Family let us make effort to imbibe those undying virtues that hallowed the little family of Jesus, Mary and Joseph. We don’t actually need have large family members in order to have God at the centre of our family life. 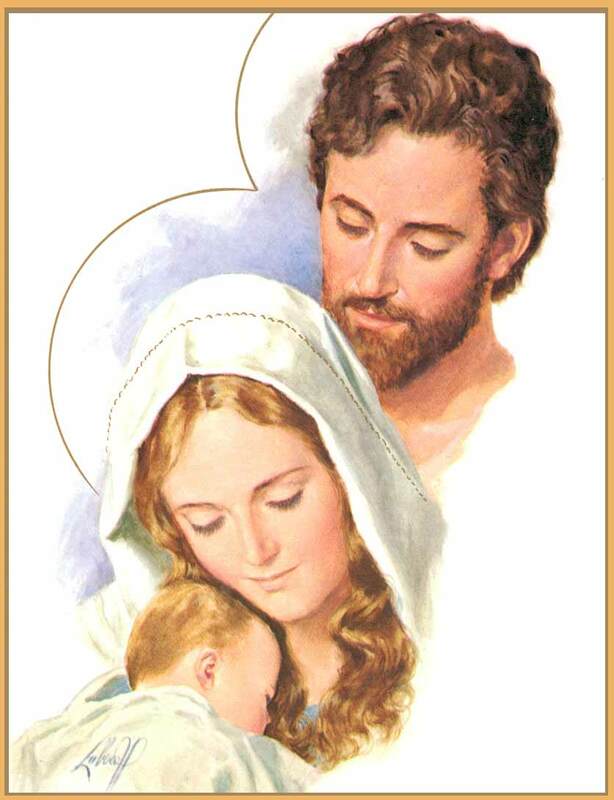 Just like the family of Jesus, Mary and Joseph our families can become hallowed through our commitment and attention to God in faith, hope and love. Have a blissful celebration of the Holy Family.